The device can be controlled by an application on the host side using our USB HID, RS-232 or LAN interfaces. You can also use the keypad on top of the device to control it manually. 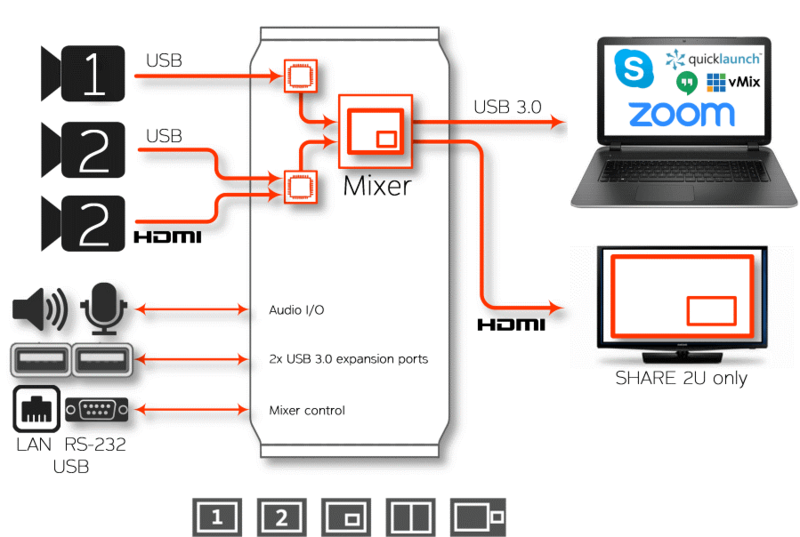 You can use the Mixer feature of the SHARE 2U to embed your two video sources into one single stream. This feature can be an important asset for you if your application only supports one video interface, like Skype®, Zoom®, Webex®, GoToMeeting® and all video conferencing applications. Here are the different Mixer configurations. The device may be controlled by the Control App or via an included API so you can design your own. You can read the sources status, presence, format, modify the EDID, update the firmware, etc. and ask for custom functionalities. You can also get Crestron modules in order to control the device using the LAN or serial interface. You can get a look at the interface of the Crestron module below. Visit the Software Upgrade page under the INOGENI SHARE2U section for more details. The device has its own application in order to control the Mixer configuration using the USB HID or the LAN interfaces. You can also monitor the firmware versions installed on the device and the status of the inputs. You can update your device to the latest firmware using the Update menu. The C++ source code of this application is available on demand. 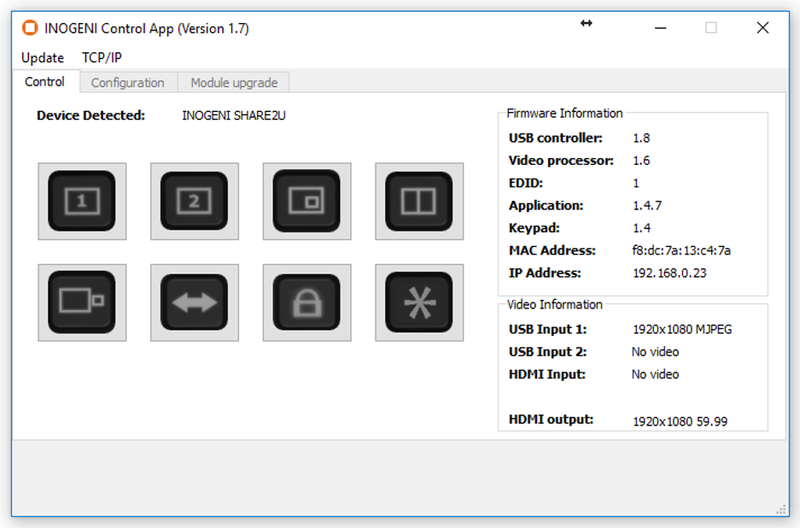 Visit the Software Update page under the INOGENI SHARE2U section for more details. When the SHARE2 or SHARE2U is positioned in an inconvenient area of the room because of your computer and video source cables, you can connect the SHARE2U wired remote and change images from a better place in the room. This is a generic room with cameras mounted at the front. The purpose of the room is to support a live, interactive webcast of the nine meeting members, the meeting leader and a remote site. The people they are speaking with appear on a large screen. This could also be a one way webcast more like a news report in which case you would only require one large screen to serve as a monitor. Using a CAM 300 you could include a 3rd camera in the rear of the room directed on the meeting leader/moderator. Each of the people will have information to offer so their faces must be seen and their voices heard. The meeting leader/moderator will operate the video player or computer and the INOGENI SHARE2U. 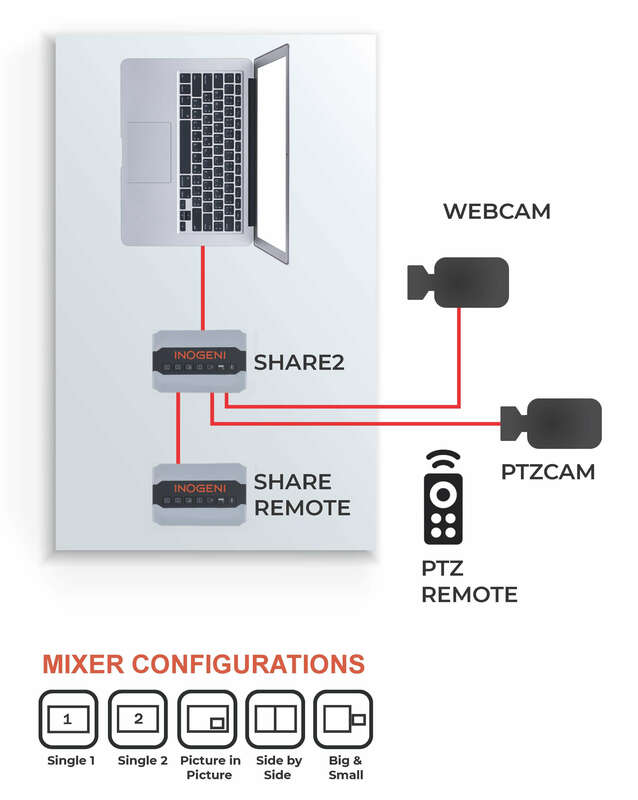 In addition to the two PTZ cameras mounted in the front of the room there is one more source – a computer with several PowerPoint programs and some non HDCP movies that have been transferred to the hard drive. 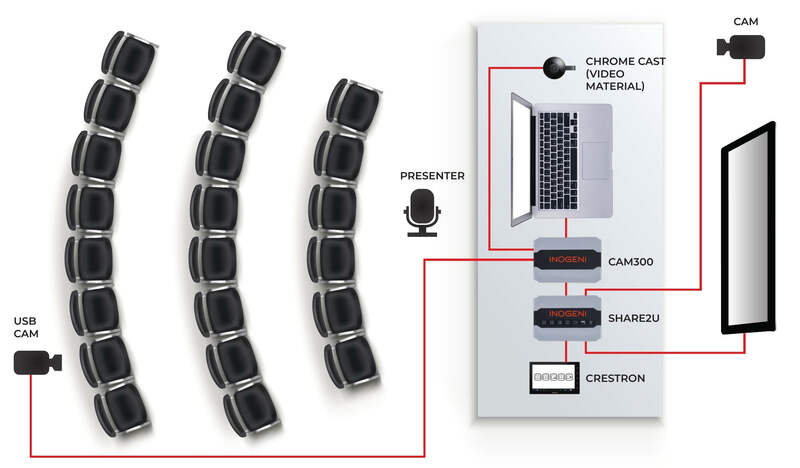 An INOGENI CAM Selector would allow the meeting leader/moderator to select between the video player, PC and one of the two cameras. If you use a CAM selector you could include a 3rd camera at the back of the room. Because the cameras are in the front of the room, it is convenient to mount the INOGENI SHARE in the front and have short cable runs. Depending on the presenter and their material, video inputs could include the output of a video player, computer or either of two cameras. In addition to the two cameras there is one more source – a computer with several PowerPoint programs and some non HDCP movies that have been transferred to the hard drive. Upstream of the SHARE2U is an INOGENI CAM 300 Selector allowing a choice between the video player, computer output and one of the cameras. The second input to the SHARE2U is from one of the USB cameras. An office used also for one person webcasts. Typical applications include a financial advisor discussing how to grow your money, a subscription website manager talking about efficient website uploads or any other one to many communication. And they can be interactive via phone call in. The presentation is webcast live and made available for online review. Everything is stored on the computer. Using the examples above, the financial advisor could show charts and graphs or pictures of suggested investments, the website manage could show example images at different resolutions showing what works best and the police chief could have mug shots, crime scene photos or aerial footage. In this case there are two computers. One is a content source and the other is for webcasting. One camera and one Computer output. 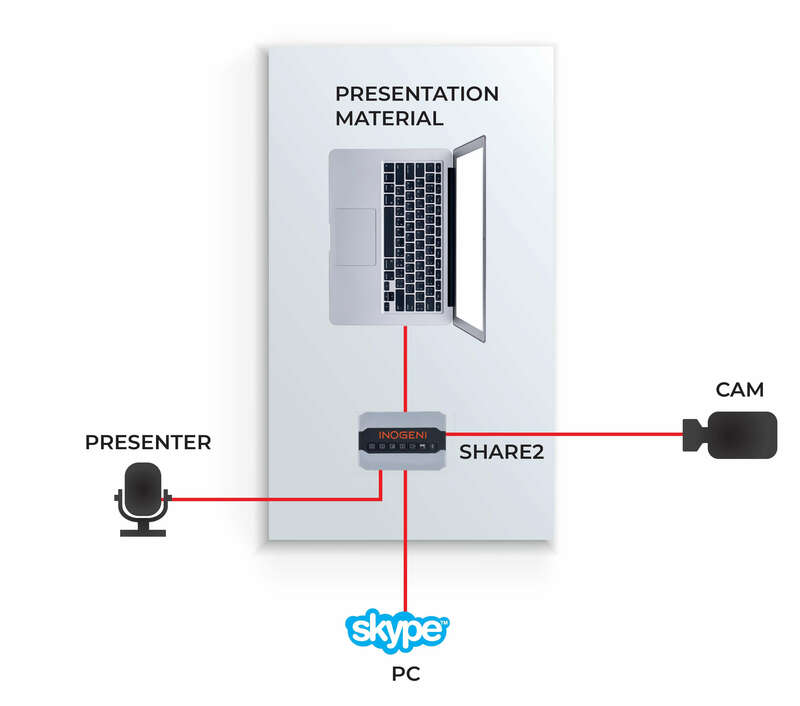 The SHARE2U can accept an HDMI output from the computer and a USB output from one camera. 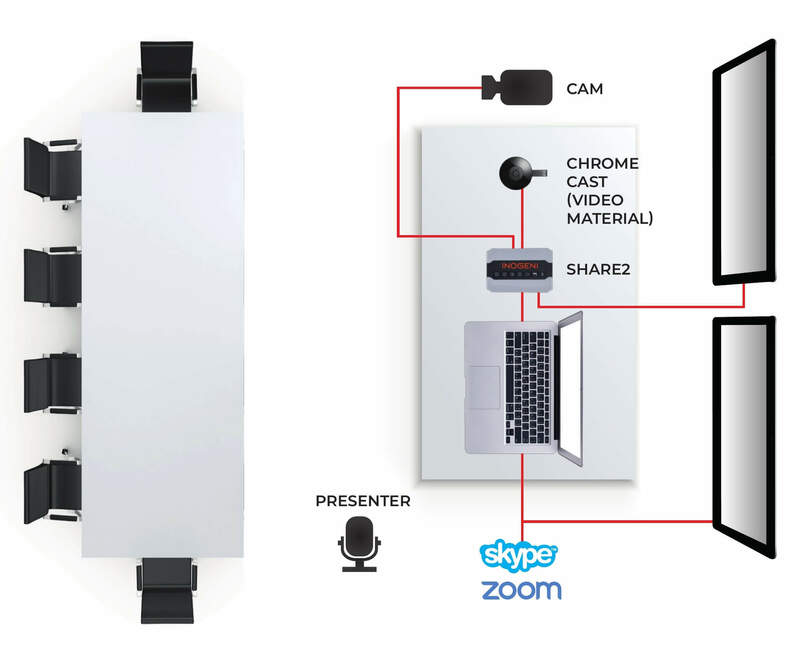 These are the components of a portable webcasting kit that can fit in a laptop case and one carry bag. Typical applications include news reporting and onsite interviews. With on location reporting there is little time to set things up and few chances to reshoot. Two cameras. One is a webcam and the other a PTZ camera. The speaker can preview their webcast on the screen of the computer. Each meeting members is important and each needs to be heard along with the meeting leader. And there is audio coming from the computer. Several third party solutions are available for handling multiple microphones or microphone arrays. If the output is analog, it can be connected to the SHARE audio input. If the audio device has a USB output, it can be connected to the SHARE USB expansion ports. You may need to run longer than normal cables to the rear to the SHARE2U. • USB 3.0 specification is 3 m/9.84 ft.
• USB 2.0 specification is 5 m/16.4 ft.
• Anything longer will need an active extender.